This “Stay and Play” package is based on 4 people staying in any 2 bedroom cabin or townhouse. 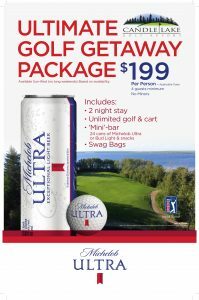 This is an exclusive offer only available at Candle Lake Golf Resort Summer 2019. Book your stay today at 306.929.2211. Cost is $199/person (plus applicable taxes and fees).